You can see above a rendering of the Firefly CubeSat satellite which will investigate 'Terrestrial Gamma Ray Flashes' (TGFs) when it launches in 2010. "Scientists theorize that TGFs are linked to lightning and result when high-energy electrons are accelerated upward over thunder storms. "(Credit: Universities Space Research Association (USRA)) Here is a link to a larger version of this picture and to USRA news release about the future Firefly mission. So Firefly will study TGFs. But what are they? Here is NSF answer. "TGFs are short, powerful bursts of gamma rays emitted into space from Earth's upper atmosphere. The gamma rays are thought to be emitted by electrons traveling at or near the speed of light when they are slowed down by interaction with atoms in the upper atmosphere. These events may occur much more often than realized and may be associated with a significant fraction of the roughly 60 lightning strokes per second that occur worldwide. They could have a large effect on the upper atmosphere and near-Earth space, scientists say." And here is what the NSF says about the future Firefly mission. 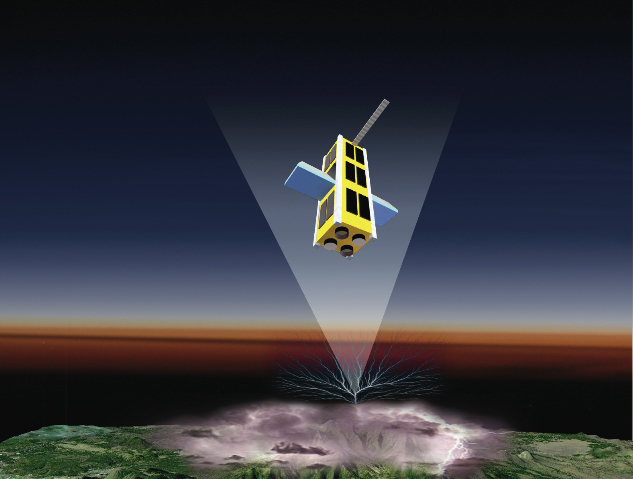 "'This mission could provide the first direct evidence for the relationship between lightning and TGFs, and addresses an important research question in atmospheric electricity,' said Anne-Marie Schmoltner, head of NSF's Atmospheric Sciences Division's Lower Atmosphere Research Section. 'Identifying the source of terrestrial gamma ray flashes would be a great step toward fully understanding the physics behind lightning and its effect on the Earth's atmosphere.' To accomplish these goals, Firefly will carry a gamma-ray detector along with a suite of instruments to detect lightning." Now, let's look at a NASA news release about Firefly for more information about these space thunderstorms. (Laura Layton, NASA's Goddard Space Flight Center, November 17, 2008). "Massive energy releases occur every day in the upper reaches of Earth's atmosphere. Lightning may give rise to these bursts of radiation. However, unlike the well-known flashes of light and peals of thunder familiar to Earth-dwellers, these energy releases are channeled upward and can be detected only from space. Our atmosphere protects us from the effects of this radiation, but the mechanisms at work can impact Earth's upper atmosphere and its space environment." Here are additional details about TGFs. "TGFs are likely produced by beams of very energetic electrons, which are accelerated in the intense electric fields generated by large thunderstorm systems. Before CGRO [NASA's Compton Gamma Ray Observatory, many scientists thought these very energetic types of radiation could be generated only near the Sun, or in black holes, large galaxies, or neutron stars. 'These electron beams are more powerful than any produced in near-Earth space, and understanding their acceleration mechanisms will shed light on a physical process that may occur on other planets, or in astrophysical environments, as well as in the sun's corona,' said Doug Rowland, principal investigator for the Firefly mission at NASA Goddard's Space Weather Laboratory." Good luck to the Firefly mission -- and to all the students involved!